The last time I wrote a foodie review was a long time ago. Frankly, this review is not really planned. It is worth my time. My eldest sister and her husband was the one who discovered the place first. 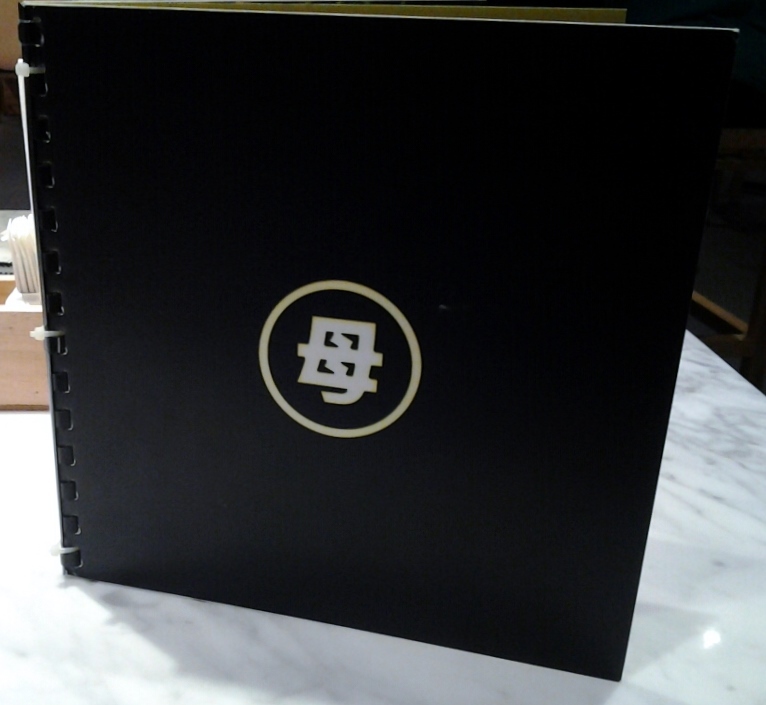 Last night, I went here to eat dinner with my two sisters. 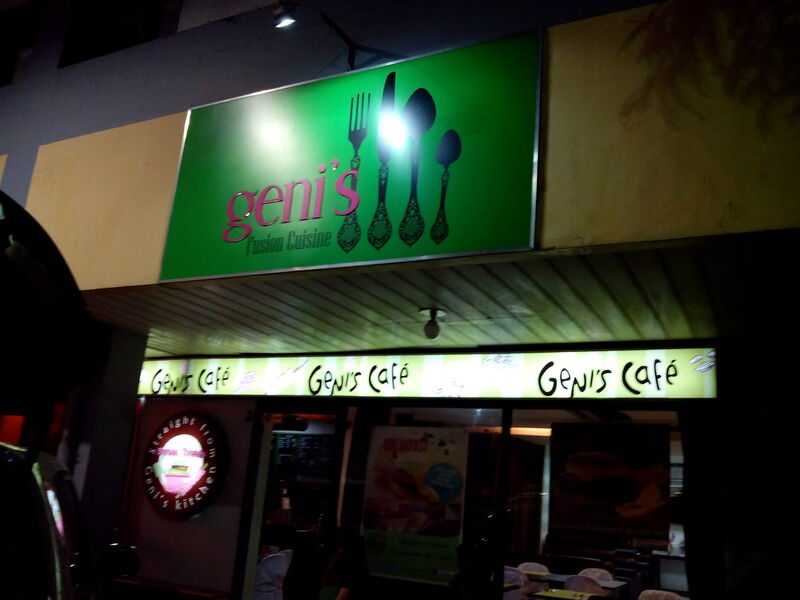 The name of the restaurant is “Geni’s Cafe”/”Geni’s Fusion Cuisine”. 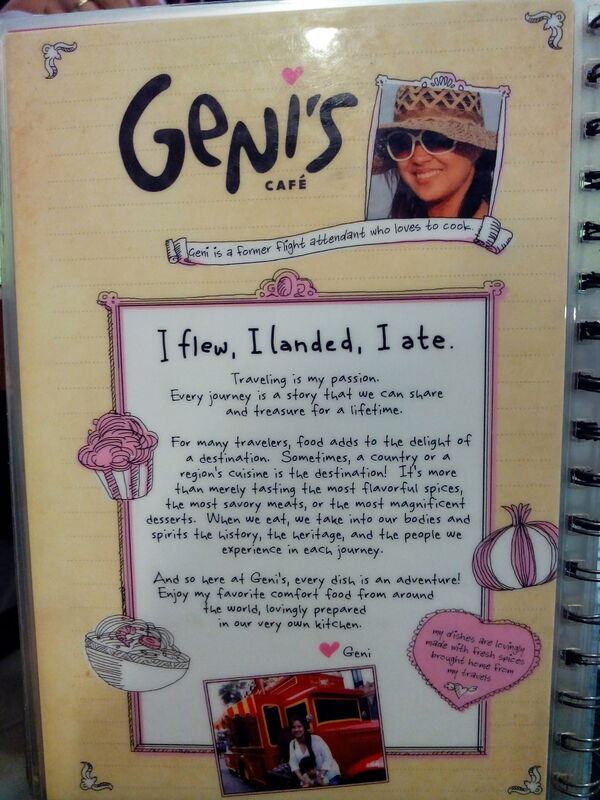 On their menu, you can find a brief background about the entrepreneur behind the cafe. YES, she’s a former flight attendant!! 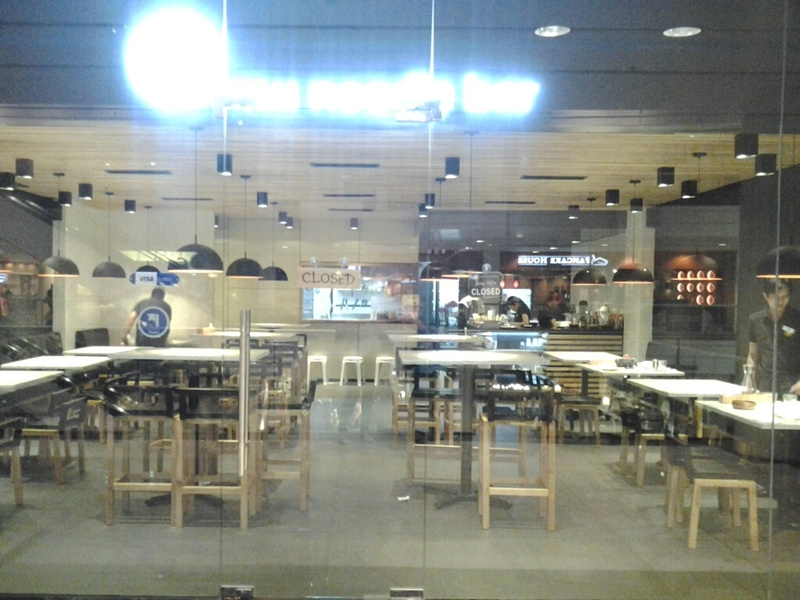 This is the cafe from outside. 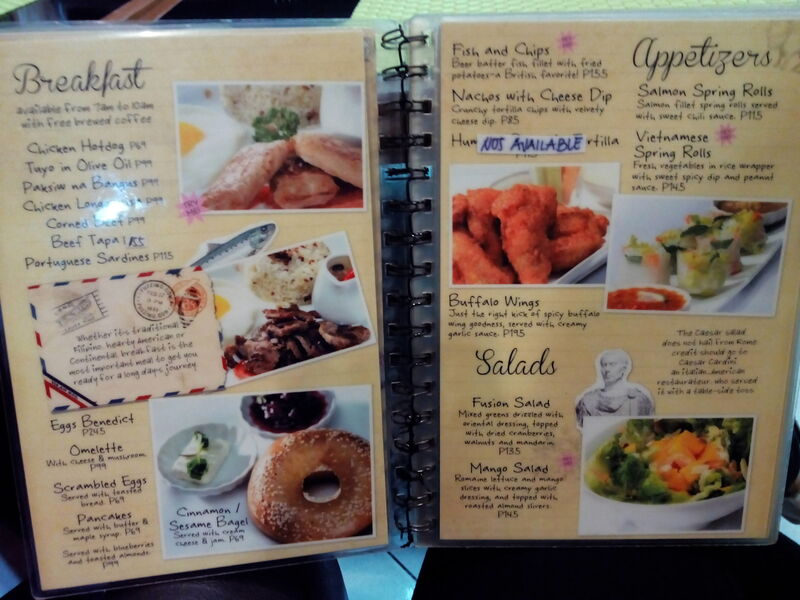 With what you can see from the photo, it looks like any other establishment here in Manila. Nothing really special or catchy. Having studied Marketing for 3 years, the power of Advertising should never be overlooked. Though their servers say that they are full especially during lunch time, I suggest that they work on their branding a bit more. 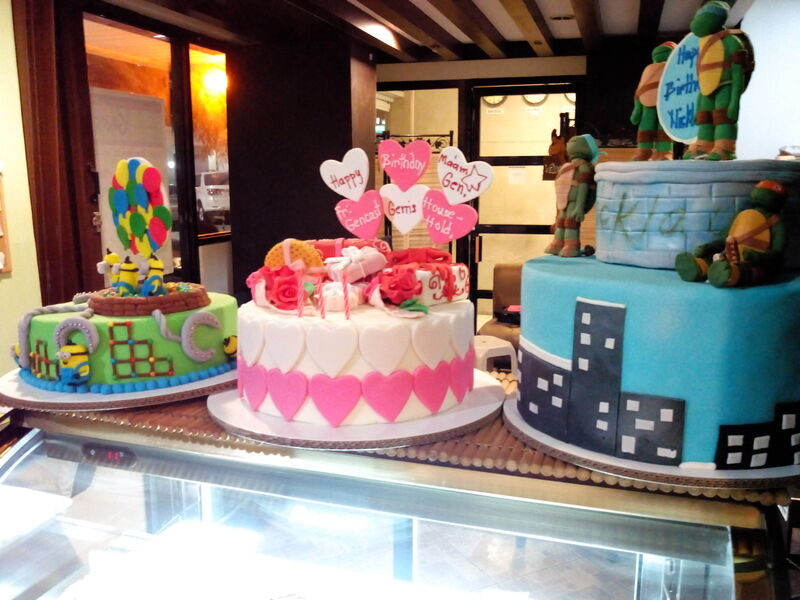 As soon as you get in, look to your left and you’ll see this..
Just a small showcase with three samples of fondant cakes that you can order from them. 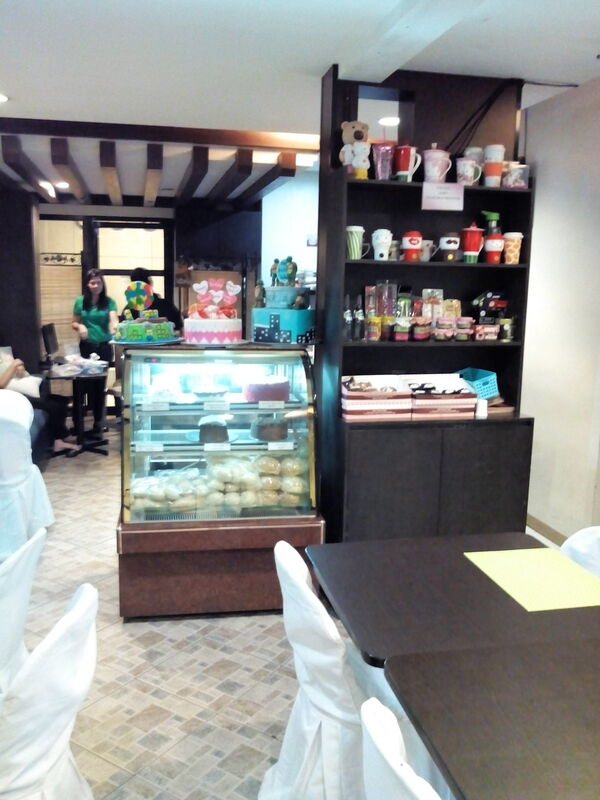 Apart from the cafe being well lit, one thing I admire about the cafe is the color scheme! The colors they used to design the place go very well with each other. Here is a closer look at their table. And now the best part.. the FOOD. As you may have noticed in their name, they serve fusion cuisine. 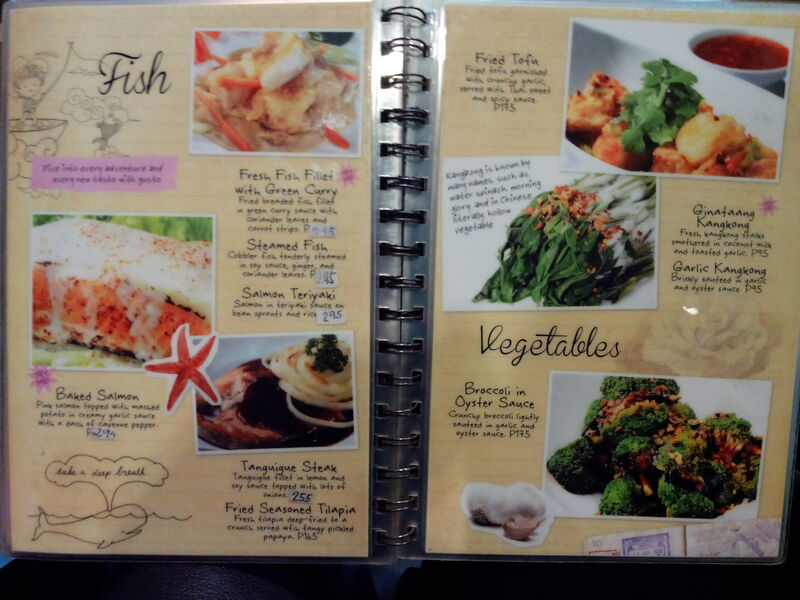 It means that they don’t serve just one type of food – talk about flexibility! OF ALL THE PLACES I’VE TRIED THAT HAS BREAD FORTHEIR APPETIZER, THIS IS MY FAVORITE. I don’t know how they did it but even though the bread wasn’t newly baked, the texture of the bread was perfect. It had a crunch that makes you want to eat and eat and eat the bread. To add to this, the butter that comes with it is not tasteless! 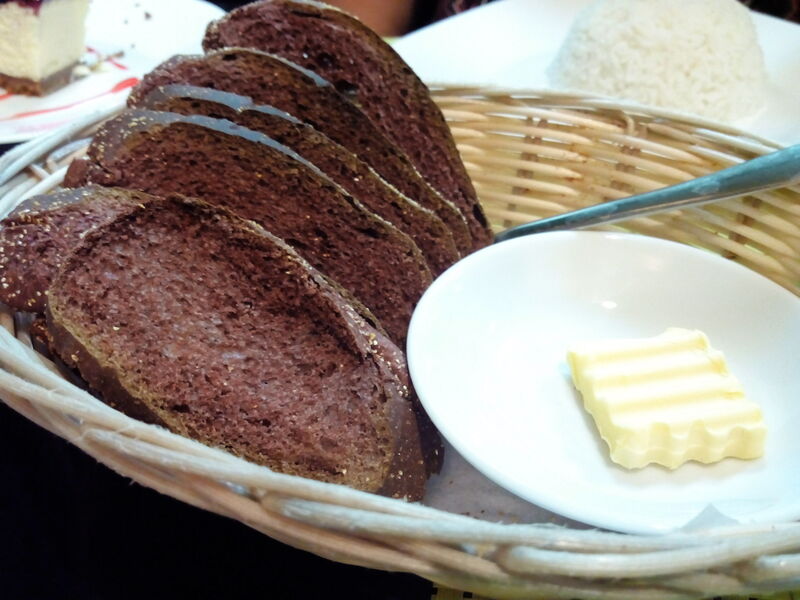 Rather than the ordinary butter served at restaurants, theirs seem to have a rich taste in it. Without a doubt, I gave their appetizer 5★. Now for the main entrees.. 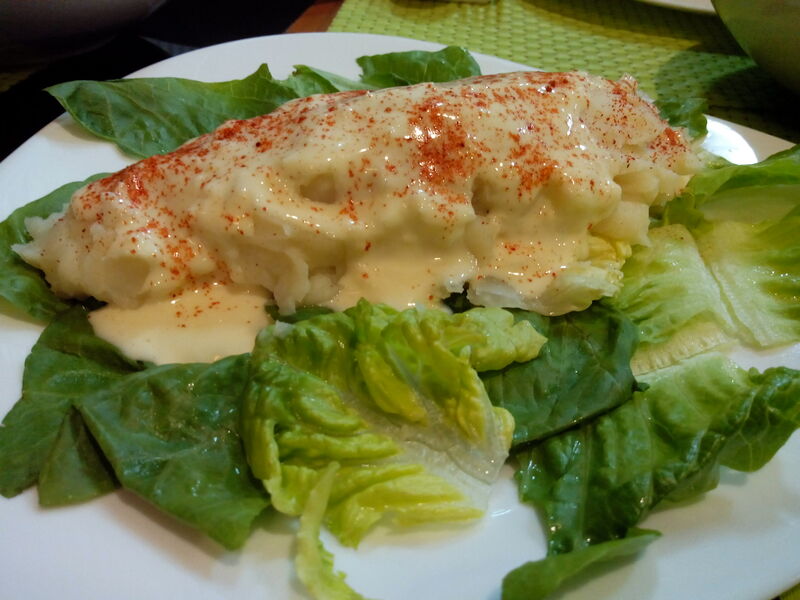 Though you may not be able to identify it, the salmon is actually coated with mashed potato. The salmon was perfectly cooked. It is tender but not too tender that it feels undercooked. The sprinkled paprika or chili powder (I’m not sure) gives the dish a hint of spiciness that complements the cream-based sauce very well. For those on a diet, I highly recommend this! 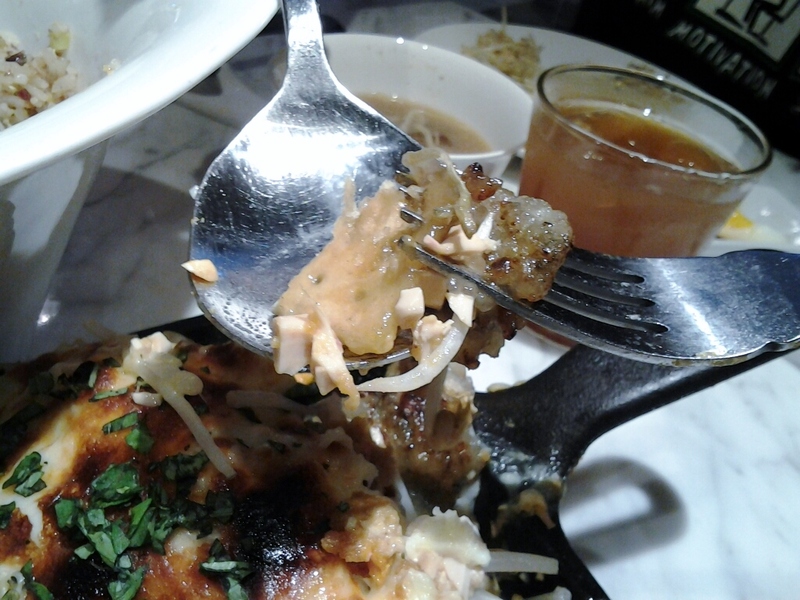 Just ask the server to have the sauce separated so you can control the portion of the sauce. 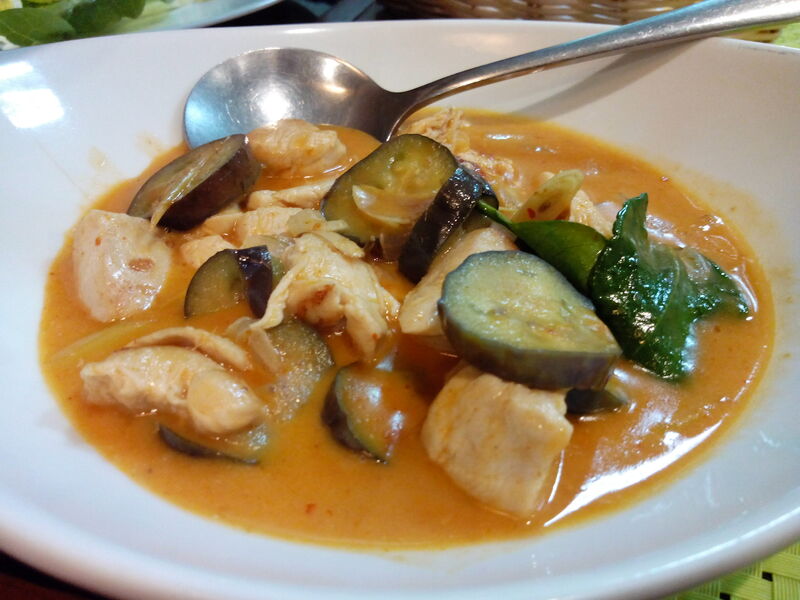 As you can see from the photo above, the sauce of this dish is not that opaque. It is a bit thin for my liking. As with the chicken pieces, it is cooked evenly. The meat is tender and when you bite it, you can see from the meat that the sauce has penetrated the inside which makes it flavorful. 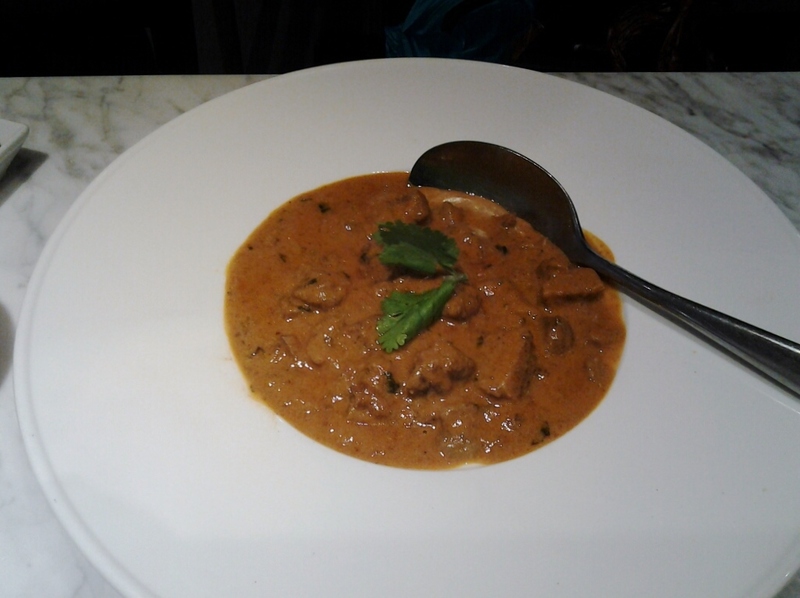 Since this is mainly an Indian dish, it was a bit spicy. The base of the sauce is cream and for me, it lacked a bit of the “oomph” factor. On the flip side, my sister liked their eggplant so much. 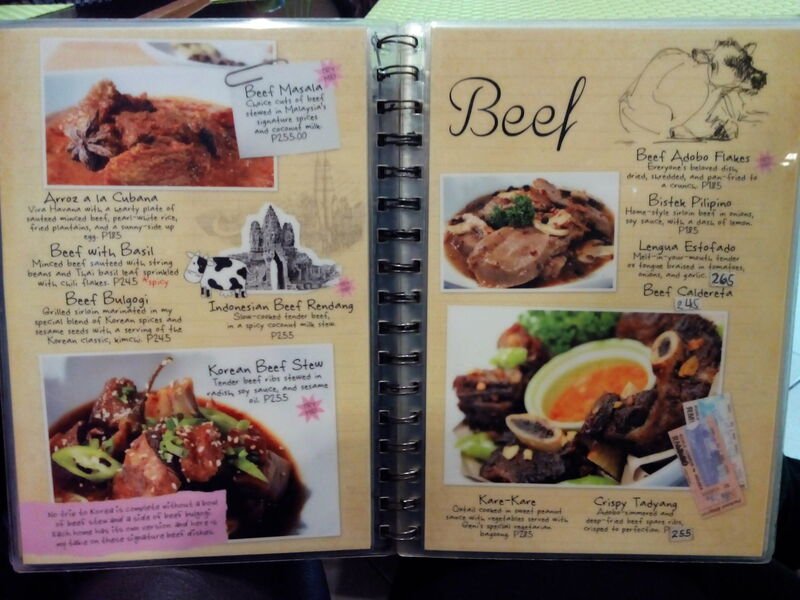 Beef is one type of meat which is hard to cook. If it is undercooked, it is tough – like your chewing rubber. When overcooked, it’ll feel like your eating chicken flakes. It seems like they had zero problem in cooking the meat! 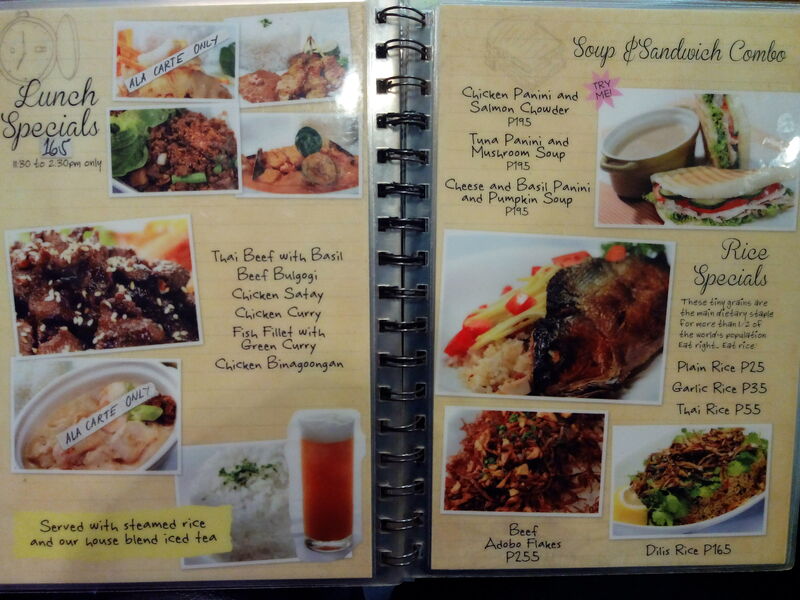 If you look closely at the dish, you will see that there are a lot of different herbs & spices in it! They are generous with the ingredients they added to this dish and because of that, it became really flavorful. 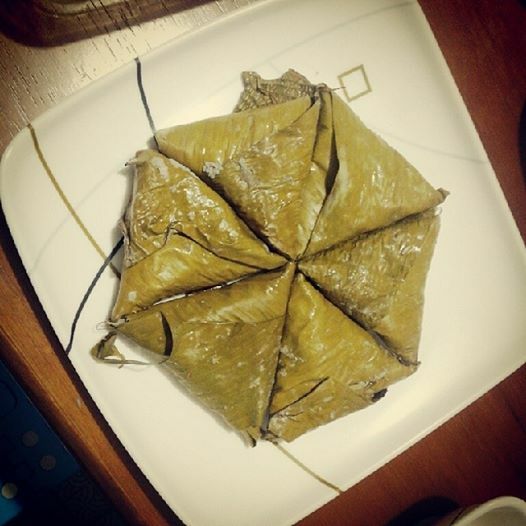 One thing I noticed though is that because it is a bit too flavorful, it is best eaten with rice. 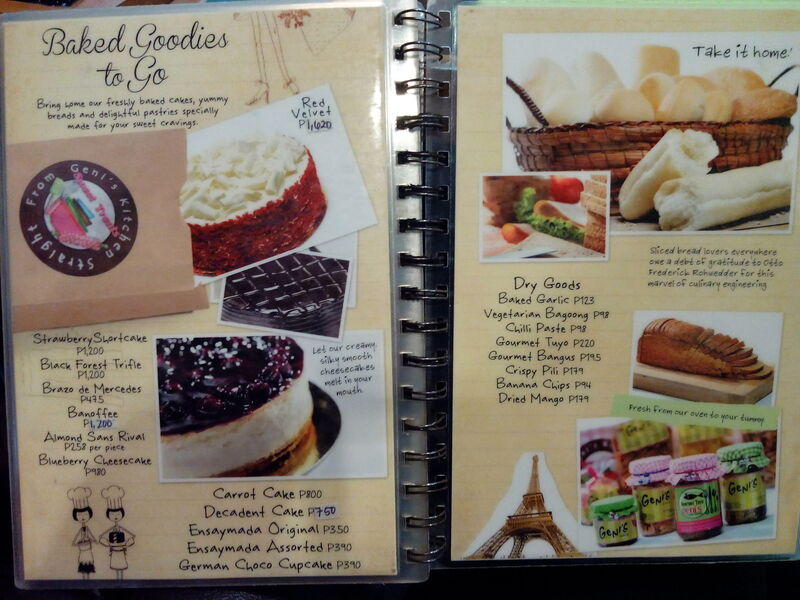 So for those who try to stay away from carbohydrates, I suggest you pick another dish. 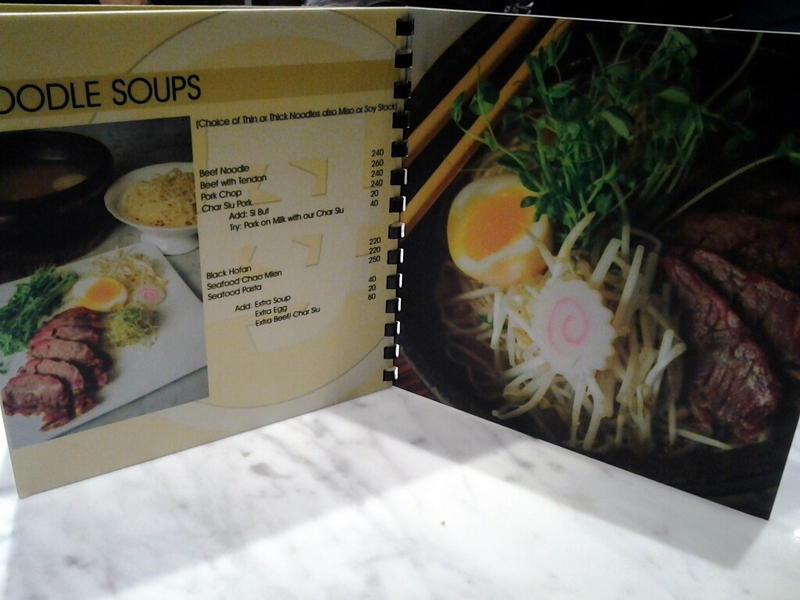 Nevertheless, this dish is delicious and worth a try! The first thing I noticed? With this slice, one to three people can actually share! If you try and have a taste of all the layers together, the flavor just explodes in your mouth. The cake base complements the cheesecake so well. 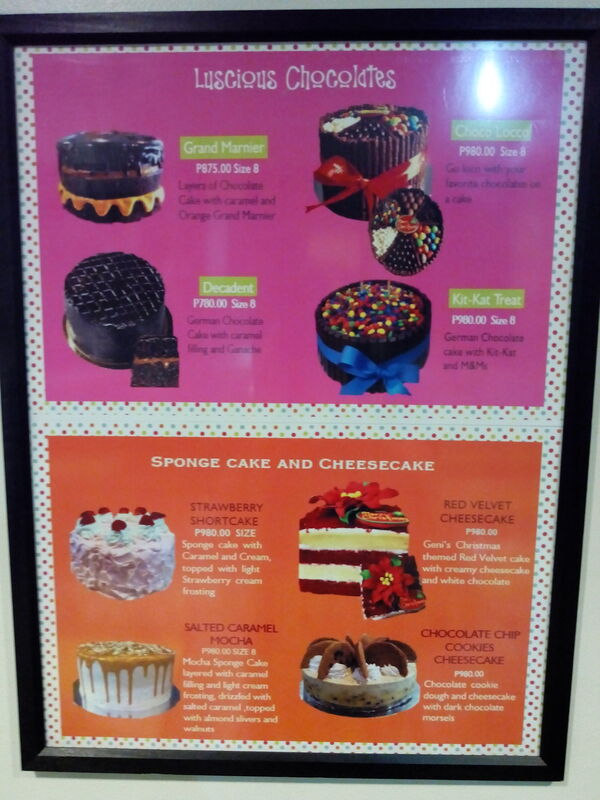 Since I am not a fan of too (“too” is subjective) sweet desserts, I’d prefer the dessert to have more red velvet cake. Sorry for the straight forward remark but I honestly am a big fan of blueberry cheesecakes. The dish was yummy but there is something – I’m not sure what – that is lacking. 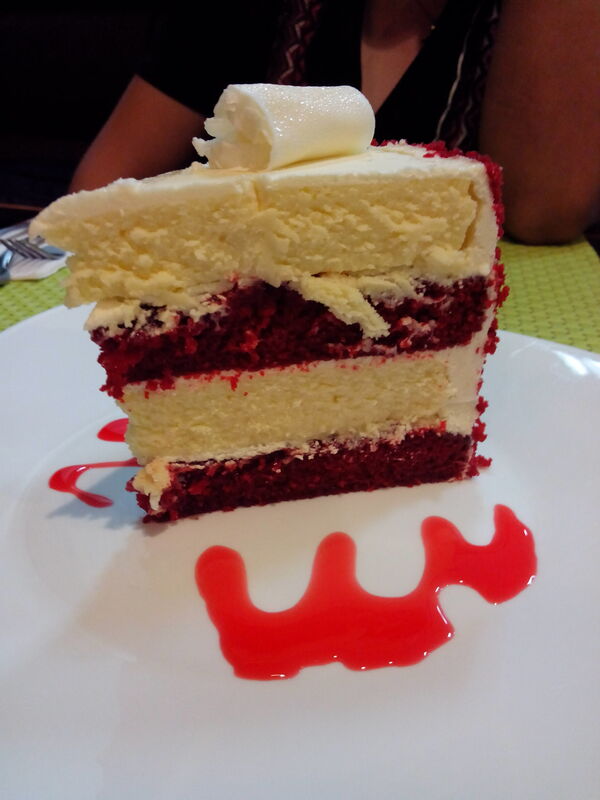 Compared to the red velvet cheeecake, this is creamier. 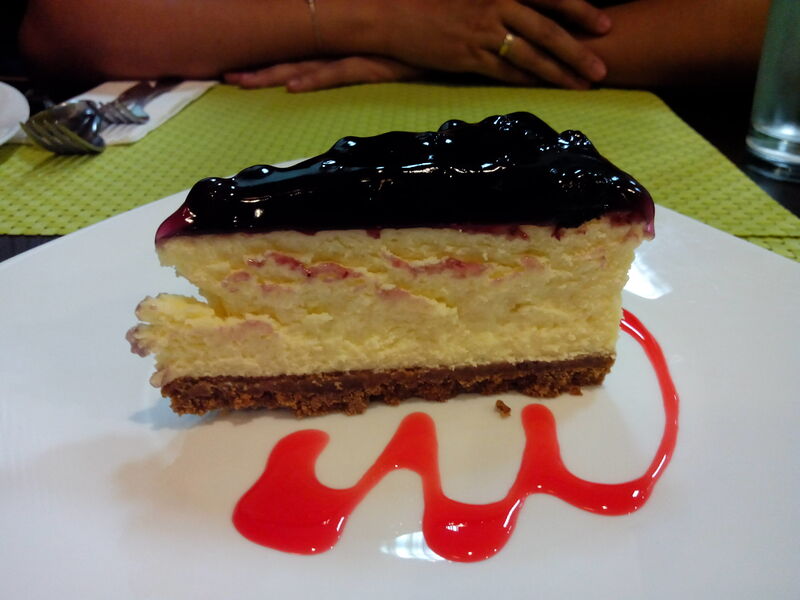 Also, the dessert has strong flavors which makes the blueberry and the cheesecake fight for the attention of the one eating. A softer crust would make the dessert better in my opinion. All in all, I HIGHLY HIGHLY recommend that you try eating here. Again, please please credit properly. All photos above are mine. Today was just like any other day…..
My sister and I were at our eldest sister’s house because my sister tutors our niece every Tuesday, Wednesday and Fridays. The tutorial hours usually starts at 6 PM and is supposed to end by 8 PM. Most of the time though, we extend because we want the tutorial sessions to be fun at the same time. We ended the session around 9 PM. When my eldest sister and her husband arrived, they brought something for us. 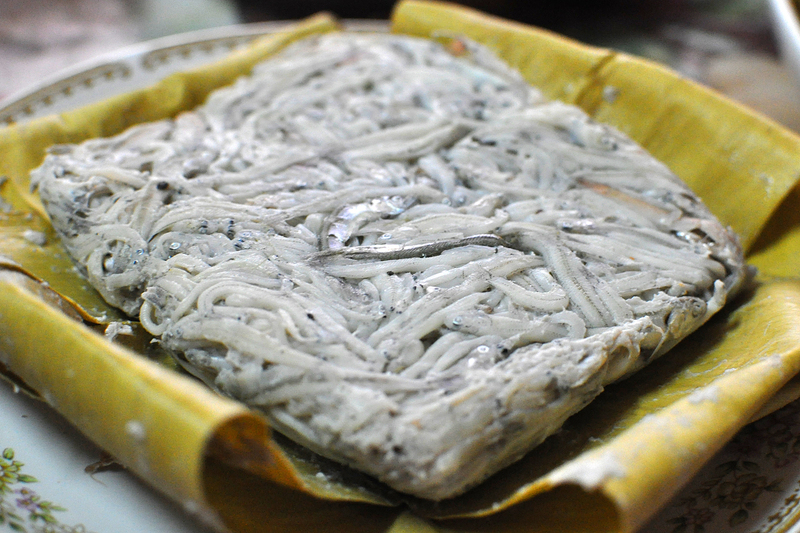 Small native fish in batangas called dulong (anchovy fry), steamed and slow cooked (sinaing) in a clay pot, wrapped in banana leaves. and dried kamias (Averrhoa bilimbi) to give a subtle sour taste. Words are not enough to express how much I am in love with this food. It may seem so simple and easy to do but once you’ve tasted it, you’ll actually wonder if there are really no other seasonings added into it! I haven’t tried making one myself but the mother of my brother in law does it so well that I wouldn’t wanna taste the dish from anywhere else. The one they brought home was from my brother in law’s mother. One day, I want to be taught by her personally cause I wanna replicate the exact same taste she makes it. Even though it made me eat a little too much that late in the evening, I had no regrets. And now I’m back to Manila! Back to controlled eating schedules. And supposedly, back to exercising. Why and where did I go? Check two of the posts before this post to find out! 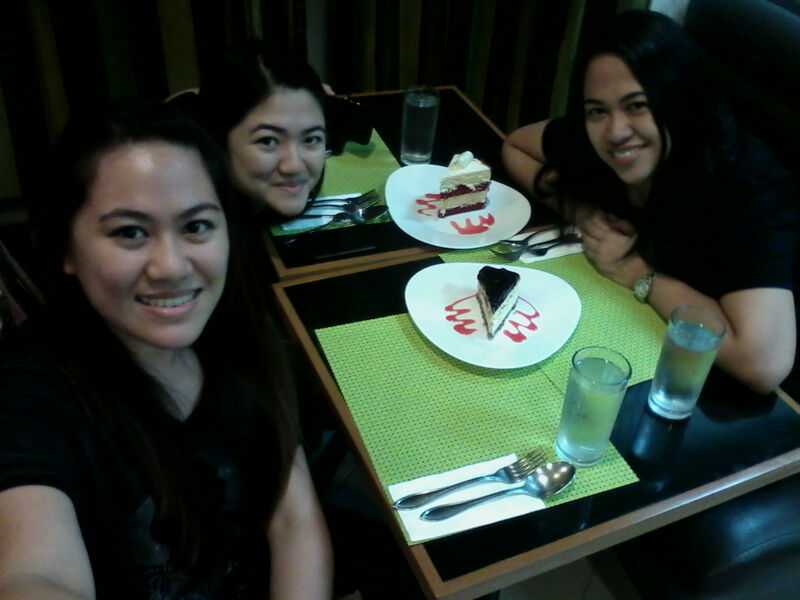 During the past two days, I was succumbed to binge eating. Now that I am off my short getaway mode self, I am not doing much and I can control my eating schedule. Luckily, I didn’t feel hungry throughout the day. I ate breakfast as soon as I wake up and had oatmeal two hours after even though I didn’t feel hungry. Because when I’m hungry, I eat a lot. Since I ate oatmeal, it is only now (8PM) that I feel like eating again. So here I am eating my dinner slowly while typing. I know a lot of people, especially moms, hate it when their children do something else while eating but I have to. 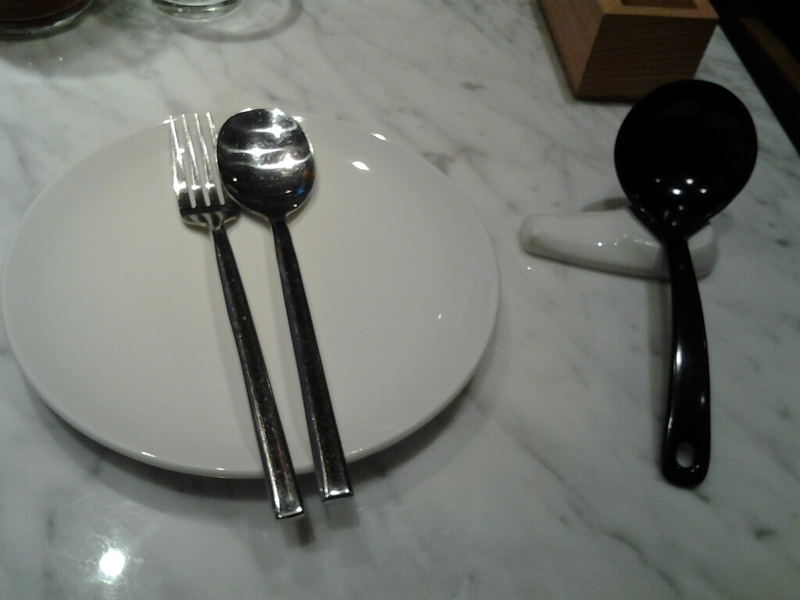 I eat fast and that is one of the reasons why I don’t feel full right away. It is best to eat slowly because you’ll give your stomach the time to process the food and for your brain to register that you are already full. During the past days I was really into getting in shape. I am not blaming the getaway for not being able to exercise! It is just that I wasn’t able to last night because I was really really tired and today, it slipped my mind. Exercise was supposed to be before bath and before dinner but before I remembered, I already took a bath. I promise to exercise tomorrow though! I need want to get in shape for myself. Once in awhile I cook but today was a bit different than usual. Main entree for tonight is none other than..
We opted to bake it so there will be no need for oil. 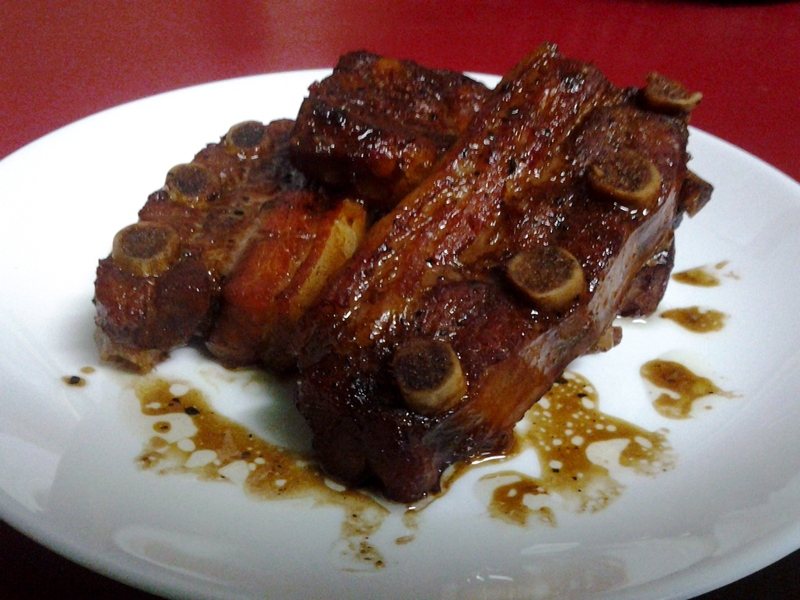 Since it was pork – which obviously has a lot of fat – I trimmed the fatty edge of the meat together with the skin. Truthfully, nothing was really measured. All the ingredients were mere estimates but luckily, it was still delicious! Also, the meat was tender. Make sure to marinade it by refrigerating it for around 30 minutes after mixing the ingredients well with the meat. It was literally slow cooked. Turn the meat every 30 minutes for even cooking. Baking time was around 1 hour and 45 minutes with a 320-350 degree temperature. After putting it out of the oven, let it rest for 10 minutes before slicing the meat. The ingredients were just basic but I believe that we need not use expensive or unique ones for our food to taste great. I know this post is long over due but.. 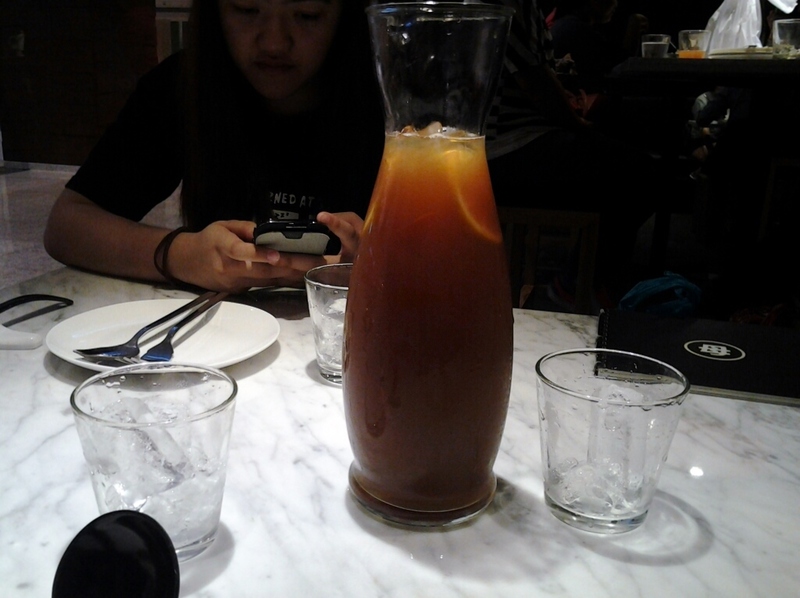 When we asked our server what their best selling drink is, with no hesitation, he said “Honey Lemon Tea”. 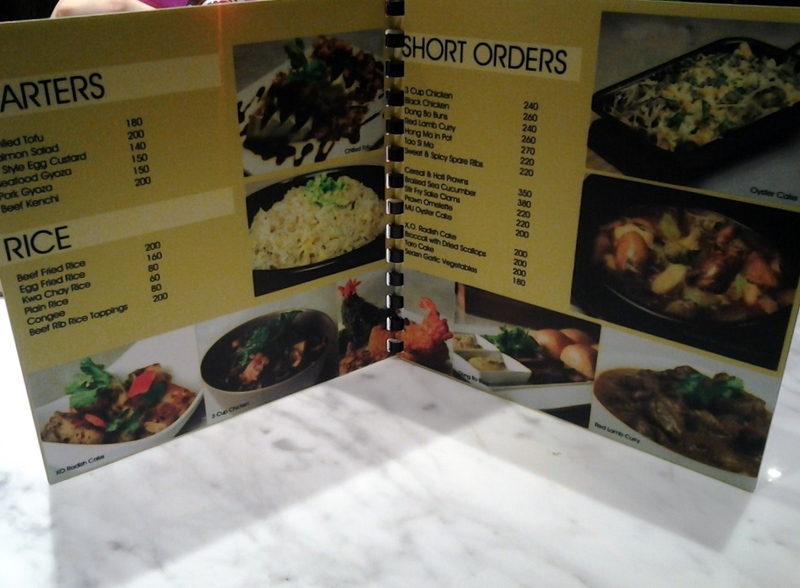 And so we ordered it. It is – without a doubt – an authentic tea. It was super yummy and worth trying!! 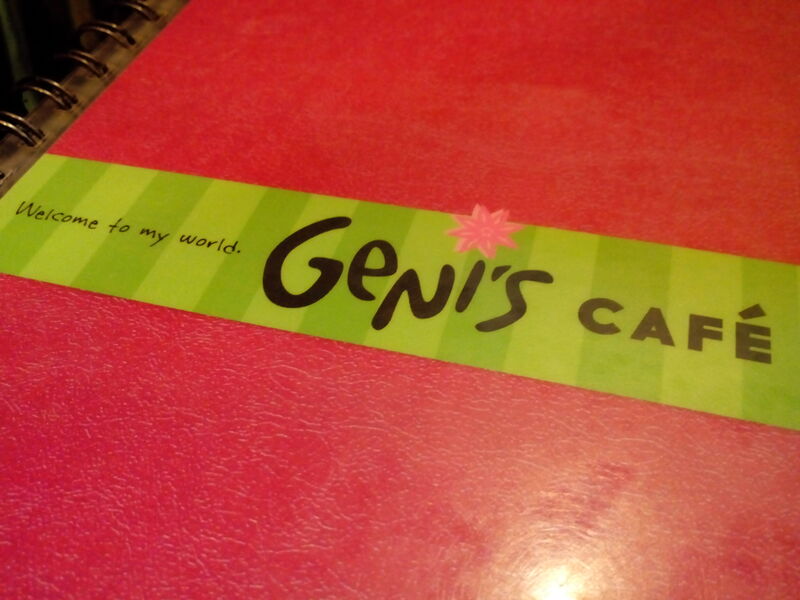 When I get a chance to eat here again, I’ll never pass on this one. 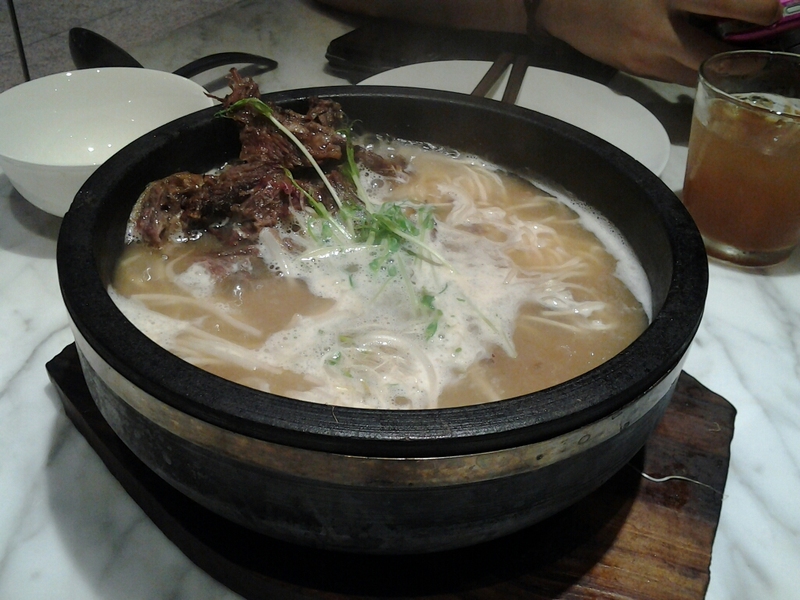 It was so flavourful and yummy. 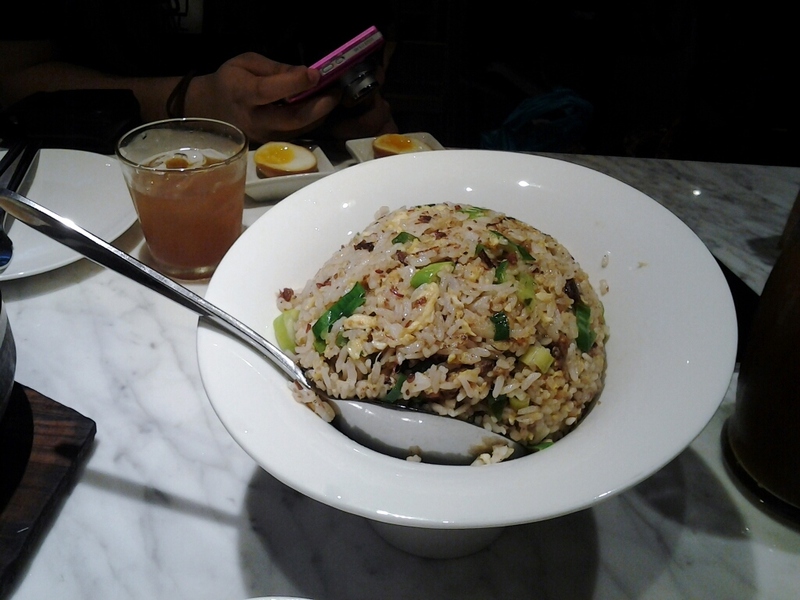 It is quite similar to chinese fried rice. I think it’ll be better if they add more beef to it. Not that it lacks beef but I think it should taste more beefy than eggy since it is beef fried rice. I wonder how their egg fried rice will taste like. It is not spicy. At all. 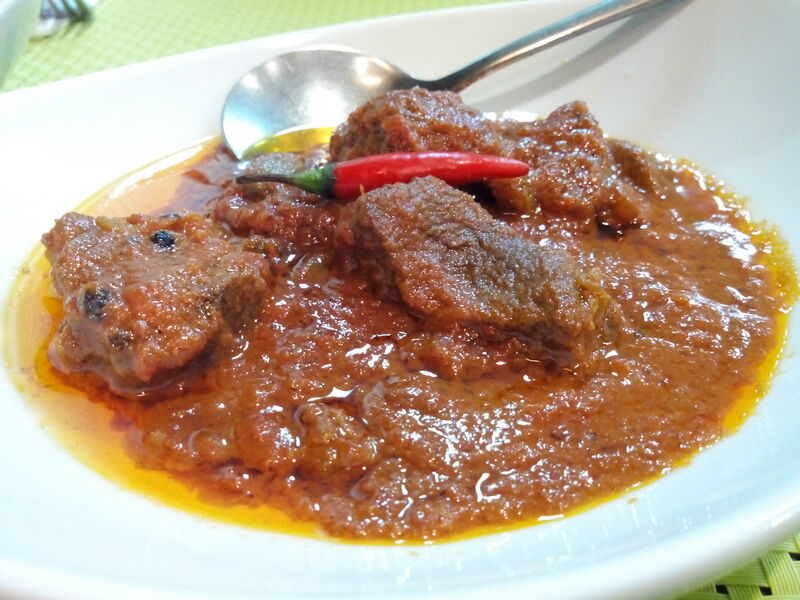 I’m not sure if it is just me but whenever I see the word curry, almost always, it has a hint of spice in it. Nevertheless, the lamb taste was really evident. Not the flavoring kind but because the lamb was really really fresh. It just had some bones and there was a bit of a bitter after taste. My sister who studied culinary arts said it was probably because the herb in the dish was slightly cooked more than usual which gives that after taste. It tastes better when served when the cheese just melted – then no salted egg or less. Don’t get me wrong.. I am a fan of salted eggs but I don’t think too much is necessary for this dish. The crust complemented the dish well. Though if you’re dining alone or just with another person, the dish might overwhelm you if you are not a big fan of oysters – big oysters. But if you are with a group, feel free to share it and eat it while it’s hot. 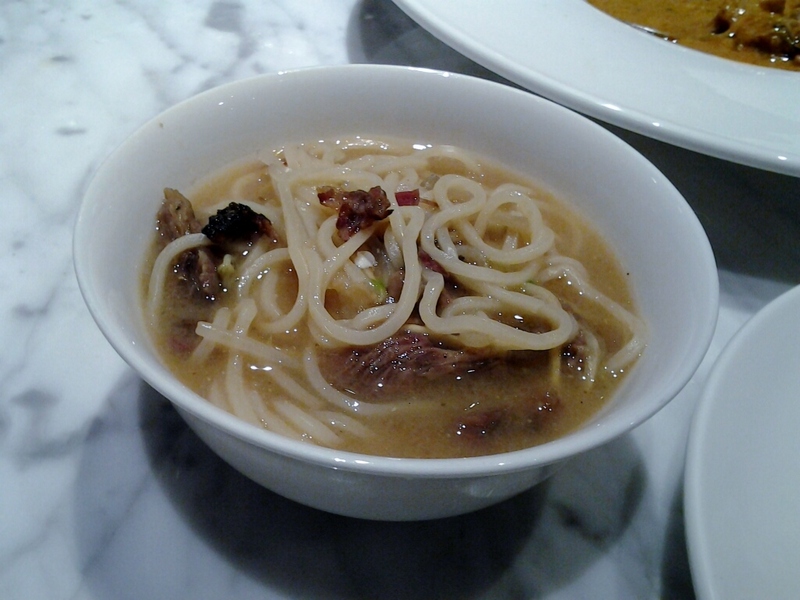 Beef Noodle Soup -miso stock- thin noodles plus extra egg! For this dish, you can tweak it a little bit by choosing your soup base and the width of your noodles. 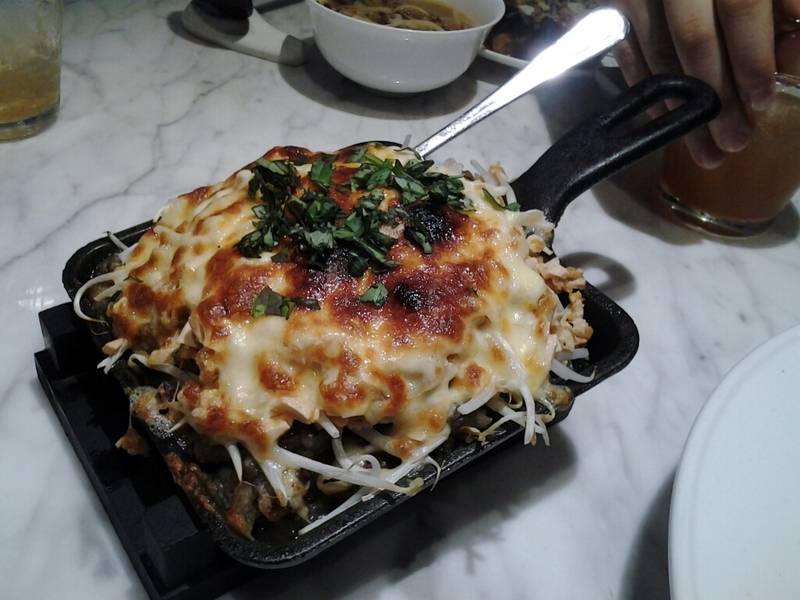 It was served sizzling hot which was great. The pasta was perfectly al dente. You can really taste the beef. 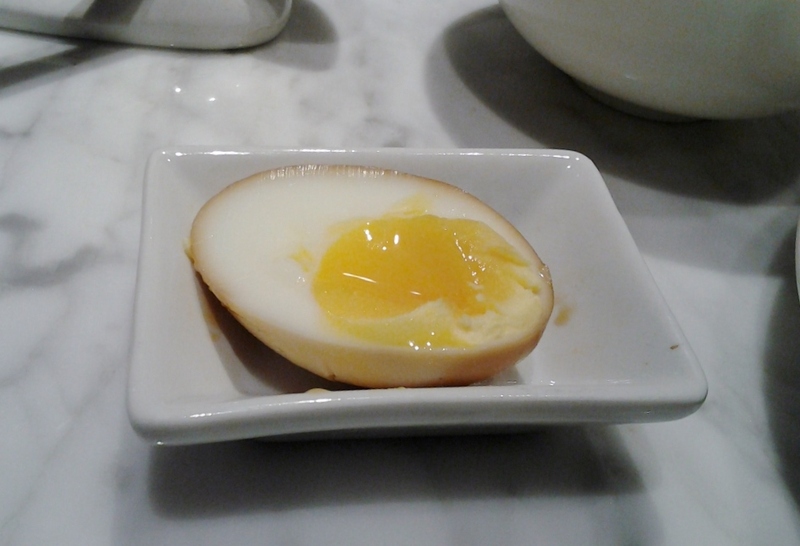 For the egg, it was soft boiled perfectly! You can get around 5 small bowls from it – for sharing. Eat it while it is hot. When not hot, we found it a bit salty. Last but not the least, the staff. The service was really great. They present themselves with a smiling face all the time. 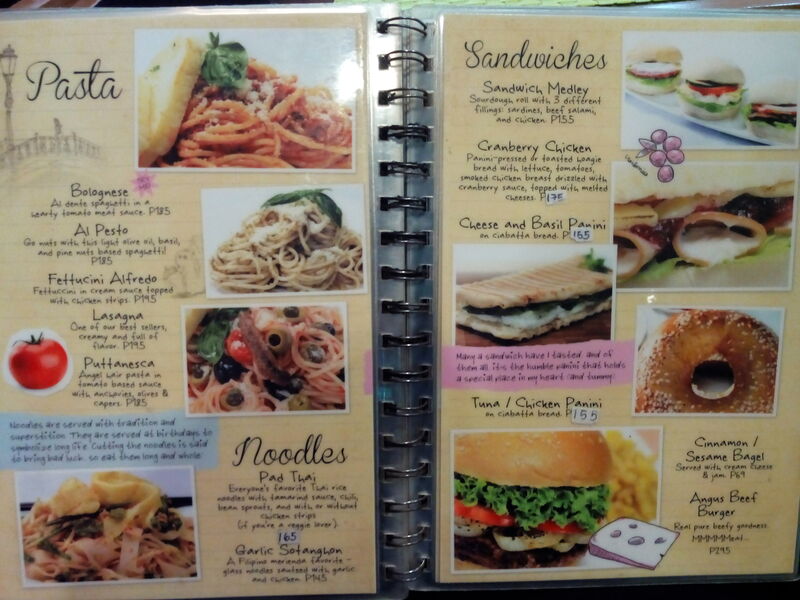 Also, they know the menu really well. 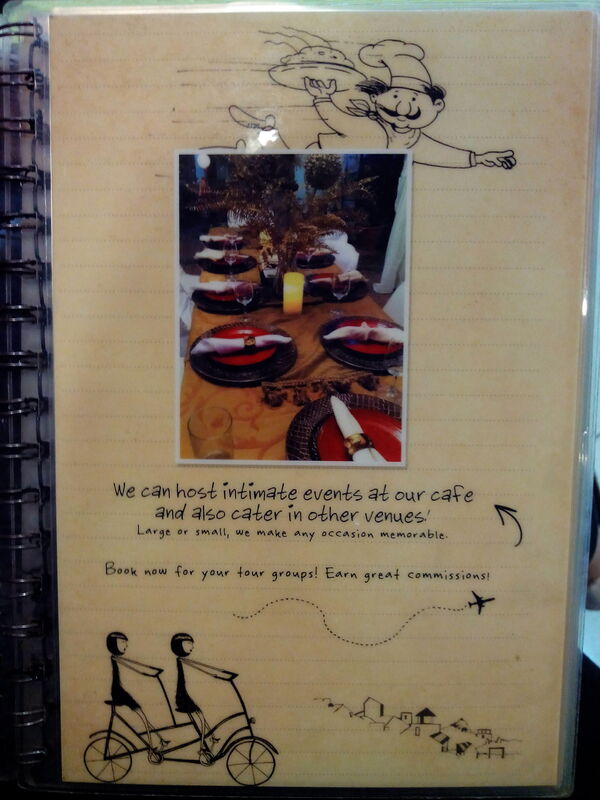 Because it was our first visit, we had a lot of questions but our server was able to answer every single question! 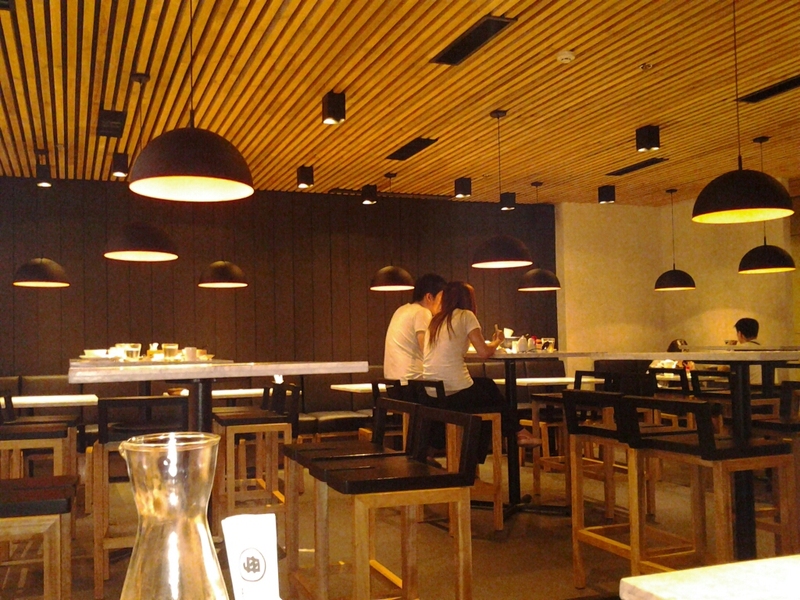 Their excellent ambiance was just a bonus. 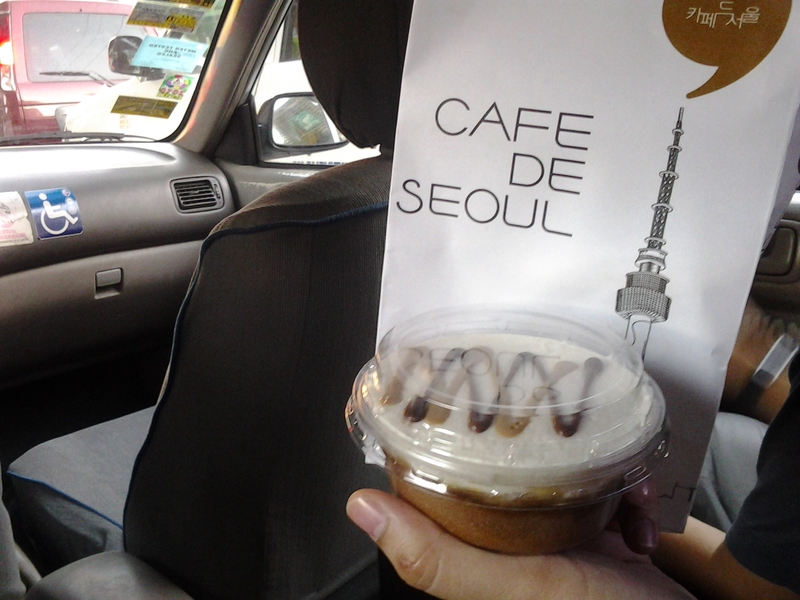 For my first review, I’m going to feature Cafe De Seoul which recently opened beside my university. 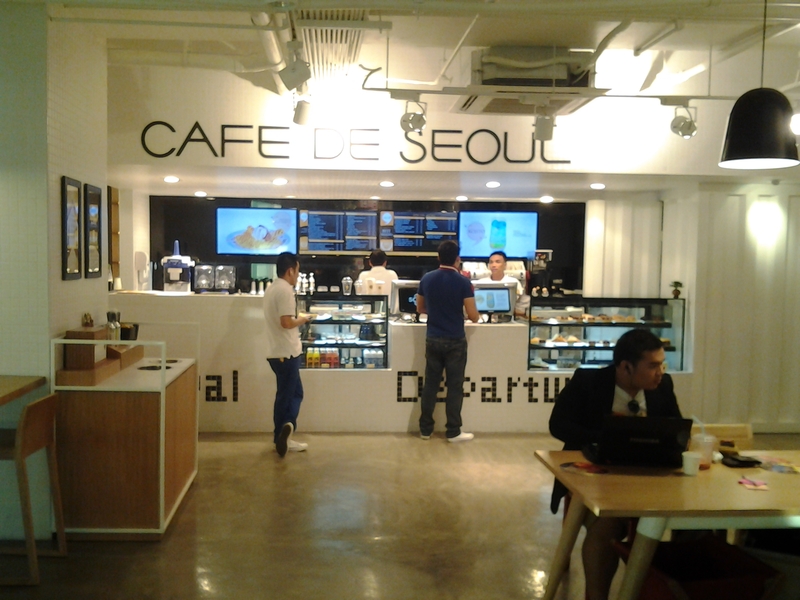 Cafe De Seoul is a benchmark of Korean style cafe that offers hot and cold beverages, gourmet products, sandwiches, cakes & pastries. 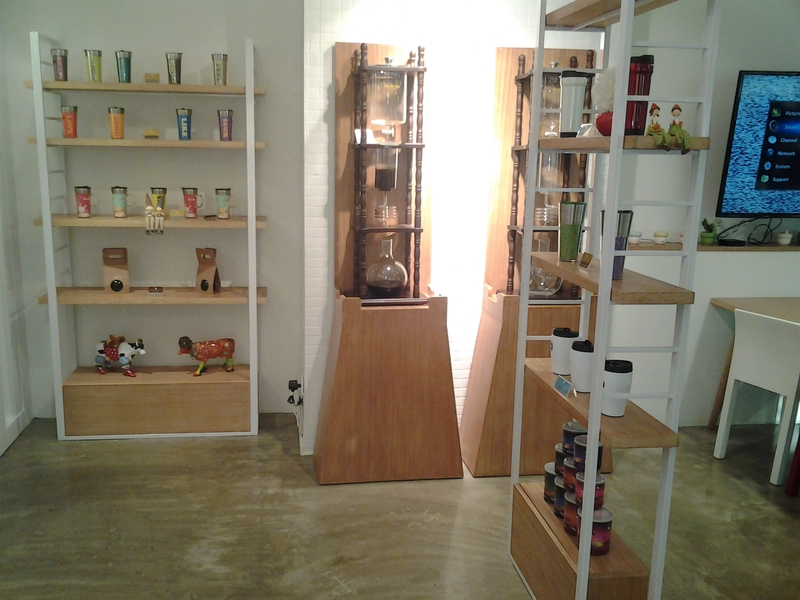 It is positioned to bring coffee and food influenced by Korean tradition and taste. 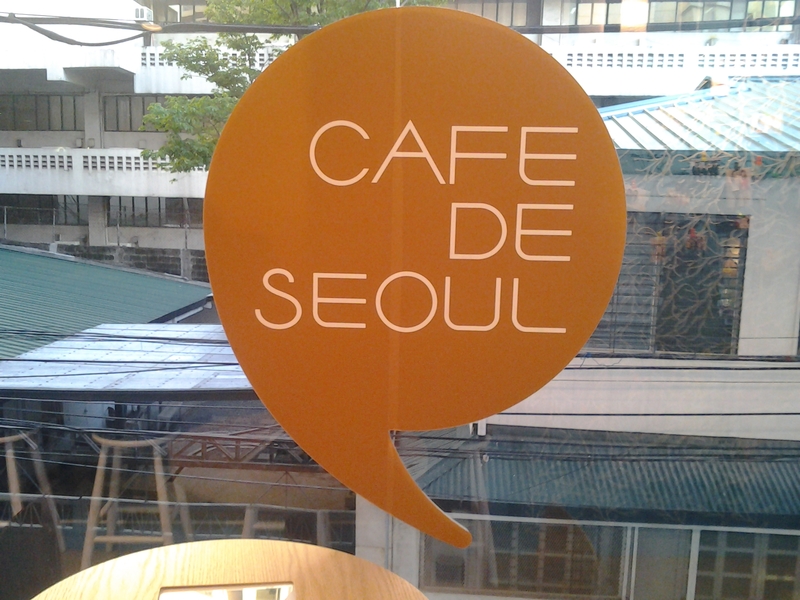 The concepts of Cafe De Seoul is based on three simple strategies; Quality Products & Services, Seoul Culture and Trendy & Modern architectural design to bring comfort and feel-good ambiance to it’s customers. And I must admit that I witnessed all of these myself in just a span of the 10 minutes I was in there. It was a Saturday when I needed to get something from school. Because I’ve been seeing the facade of this cafe for weeks already when I transfer from one building to another because of my classes and because it looks so attractive from the outside, I decided to finally take a peek. Originally, my sister and I was just supposed to take a peek inside because we have other errands to run that day but everything was just so appealing to the eye that we just had to buy something. From Wikipedia: Banoffee pie (also spelled banoffi, or banoffy) is an English dessert pie made from bananas, cream and toffee from boiled condensed milk (or dulce de leche), either on a pastry base or one made from crumbled biscuits and butter. 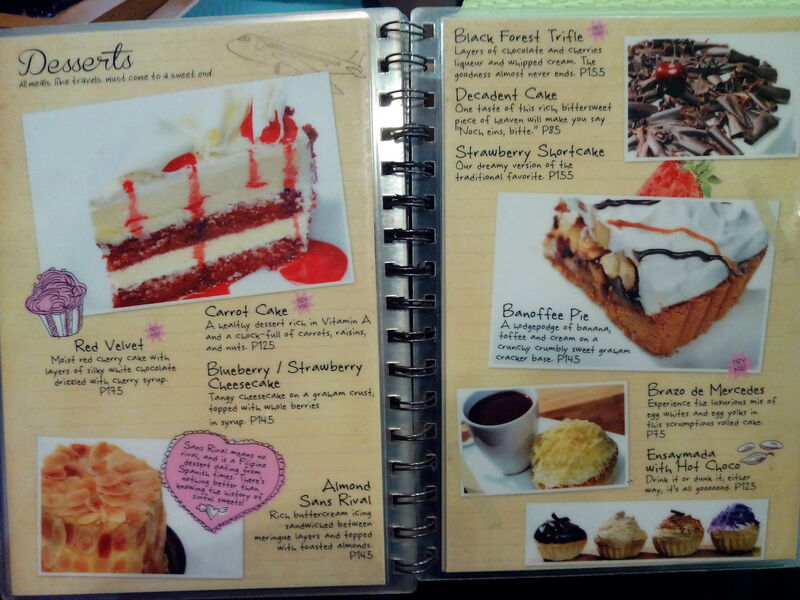 Some versions of the recipe also includechocolate, coffee or both. I am honestly not a fan of too much sweet stuff and I don’t like pies that much but because my sister wanted it, we ordered this. It was soooooooooooooooo good that no words are enough to describe how good it is. My sister is a graduate of Culinary Arts and she regularly bakes and buys sweets so I decided to ask her the more detailed review for this. Compared to the other banoffee pies that she has tried, this was different. The cream alone has a unique taste to it unlike other creams which usually doesn’t have a flavor. The bananas in it were chunks even though from the outside it looks like it only has mashed bananas. Because of the banana chunks, every bite you’ll take will be much more sumptuous. 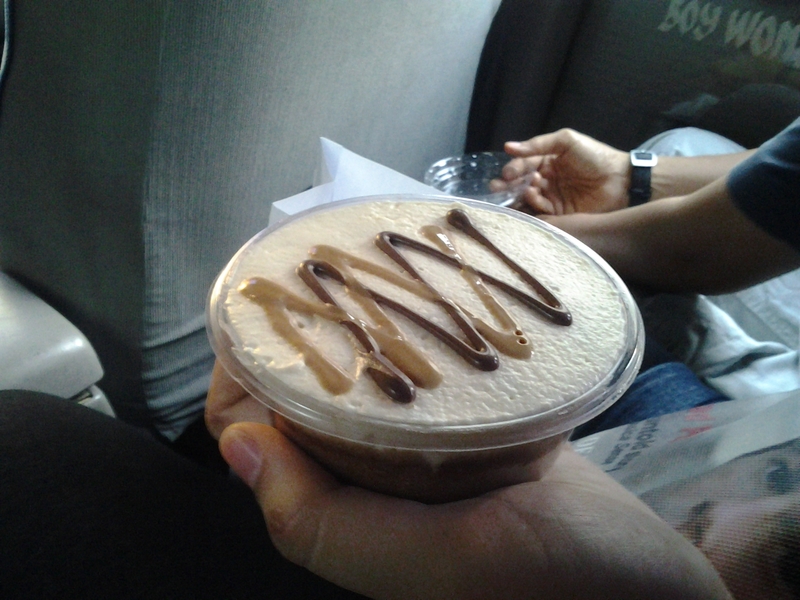 The dulce de leche was just right in amount and in level of sweetness. The drizzled syrup on the top also blended well into the whole pie. I am fond of researching about different cultures especially that of Korea. 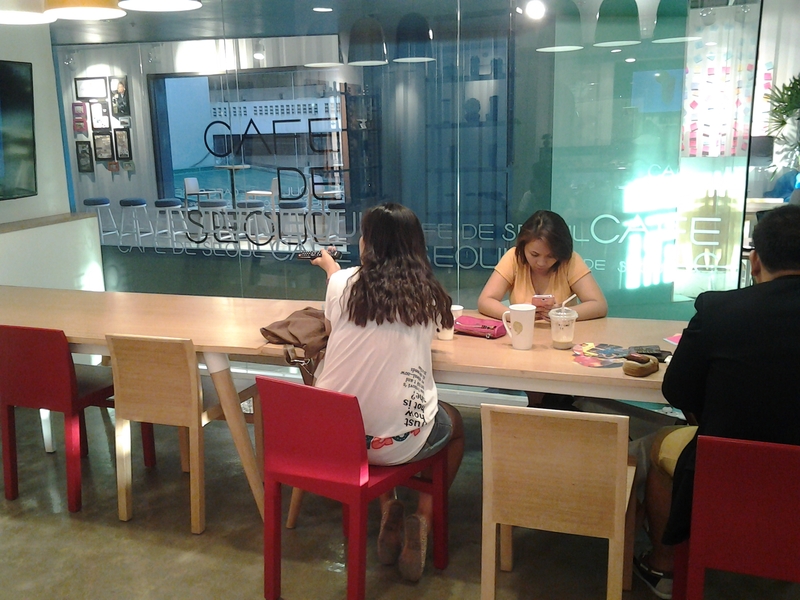 Seoulites or even just Koreans in general are known to be coffee lovers who loves cutesy and homey cafes. Also, their love for technology is evident. This cafe reflects all that. 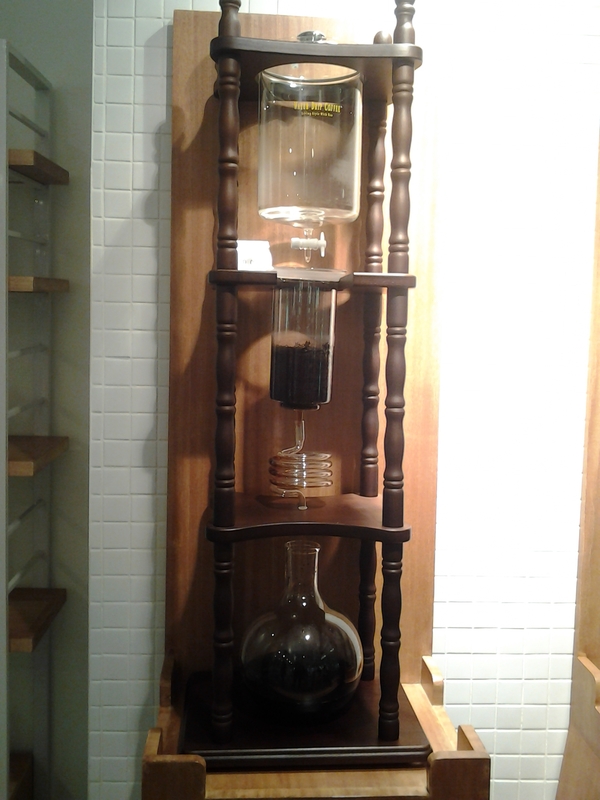 For the coffee loving part, they even have this drip coffee machine/apparatus which produces their Dutch Coffee for hours! 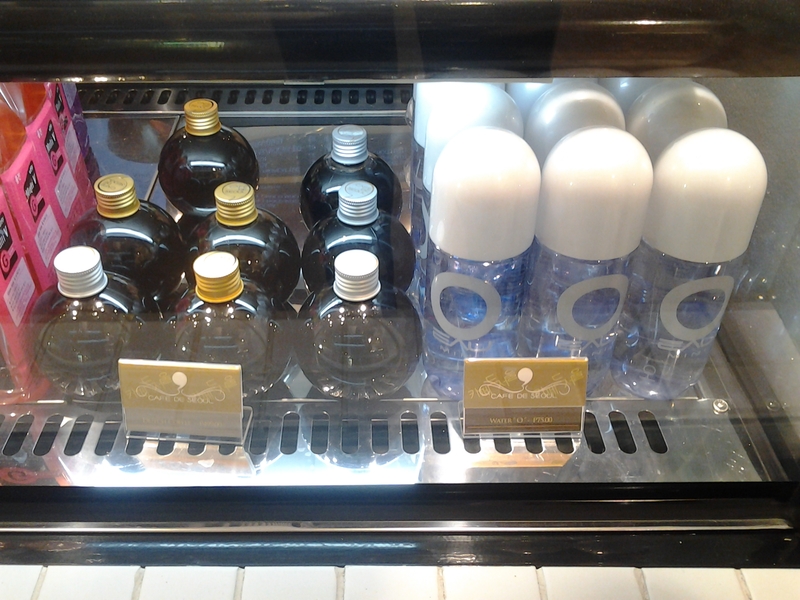 The small bottles on the left side are filled with the concentrated Dutch Coffee. Because of the mirror and the light, I couldn’t capture the price of it. Sorry! 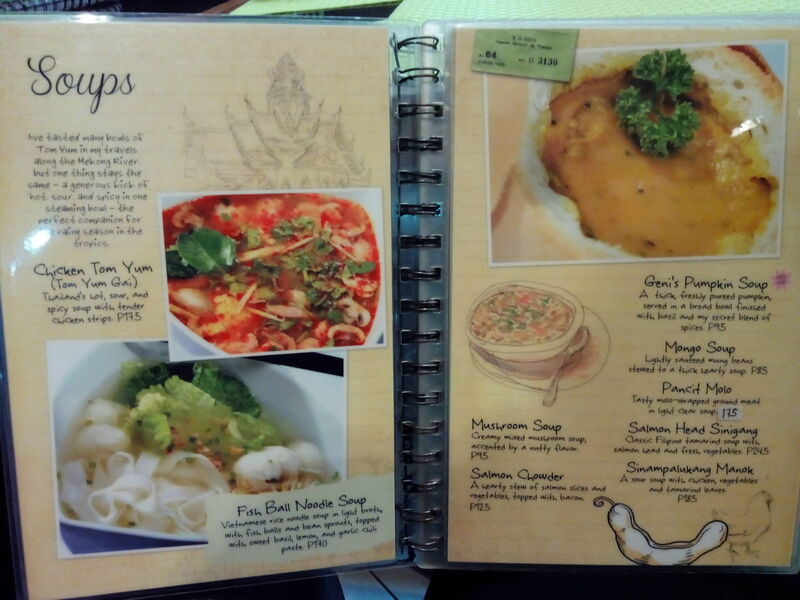 These are some books they have which you can borrow during your stay there. 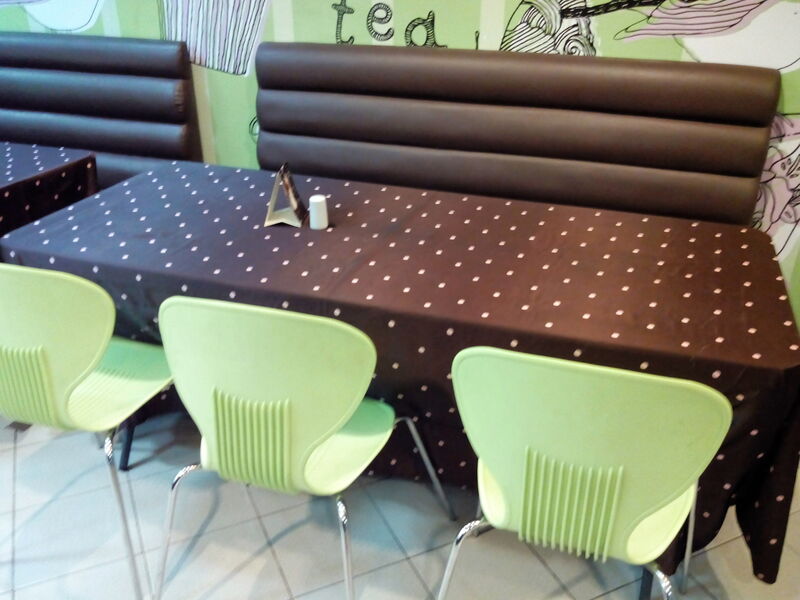 The cafe itself has a very “feel at home” feel to it. 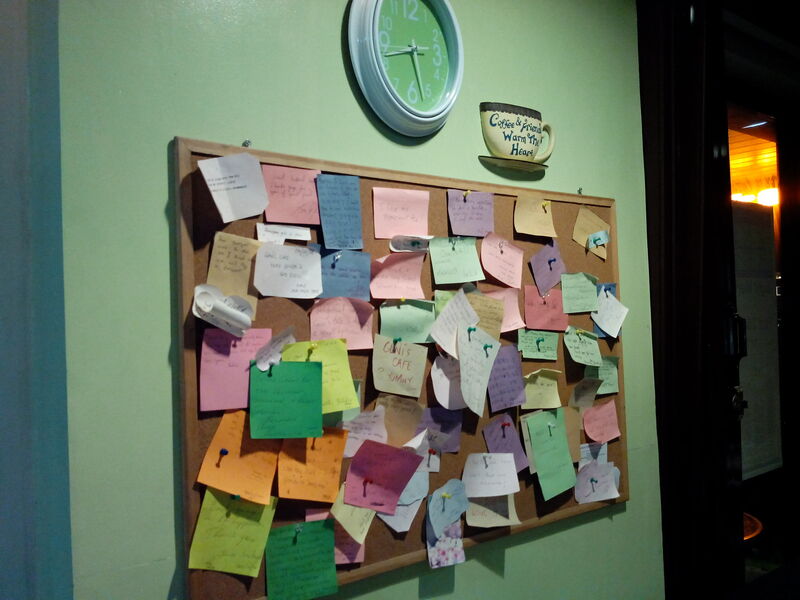 I (again) failed to take pictures of the wall decorations they have around the cafe but there is this area where you can write down notes on post-its and post it on the wall for everybody to see. 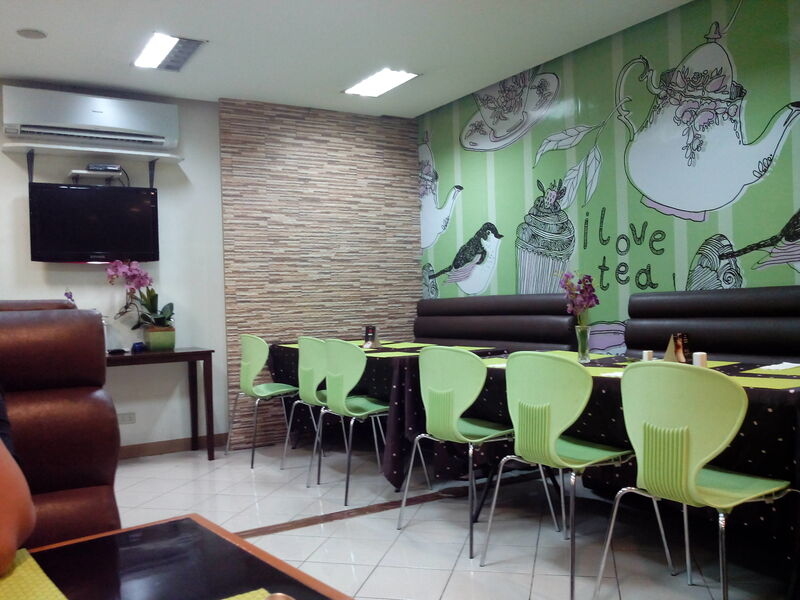 They also have an area wherein you can clip your pictures during your visit of the wall. Seoul Culture is trendy and modern in itself. What I’ve said from the second strategy is also applicable here. 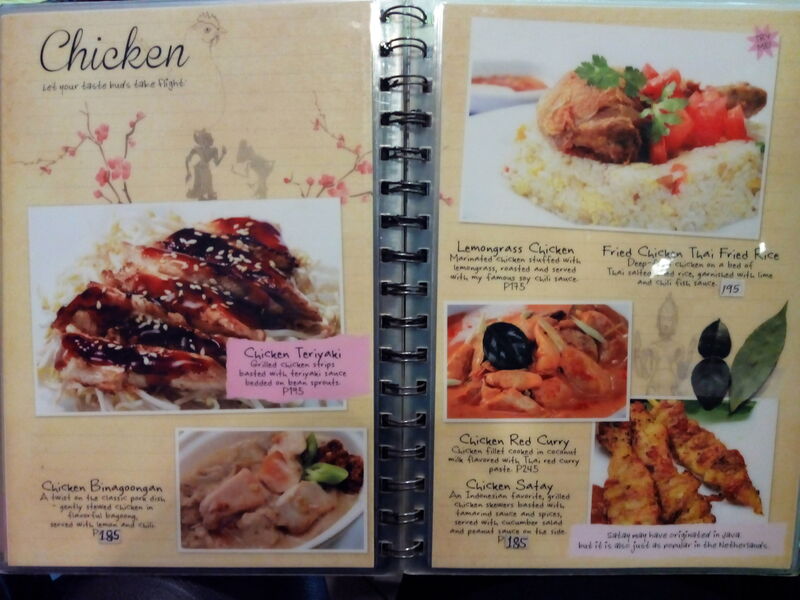 As you can see, their menu is shown on the TV screens. Also, the font of their “Departure” and “Arrival” area signifies the digital age that we have today. The two farthest TV screens are for their advertisements. 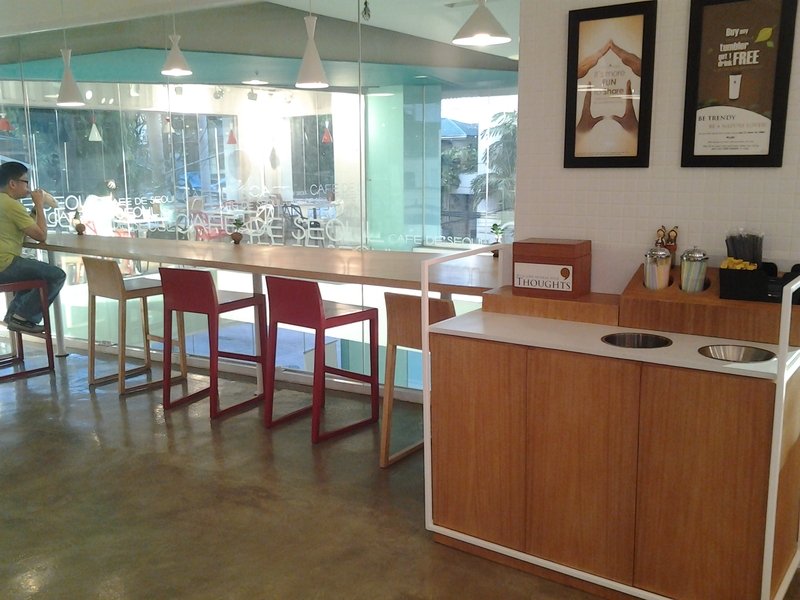 From their entrance to their decorations, you can see how modern and trendy their cafe is. Look past beyond the people here and you will see the frames on the leftmost part. There are also stools there and cocktail tables. In the middle of those tables are Samsung Galaxy tablets!! 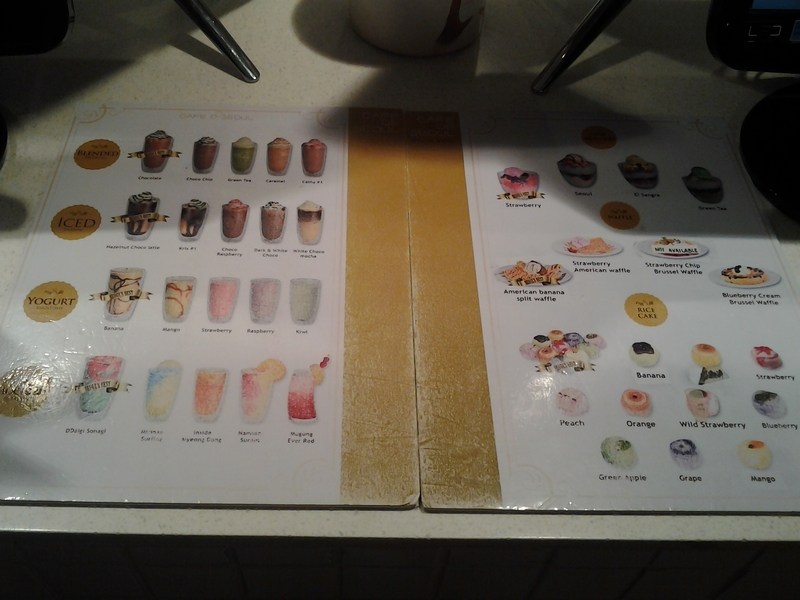 Because of the lack of time, we weren’t able to try other food or drinks but I’m sure that we’ll definitely be back here. I badly want to taste their patbingsu because the first patbingsu I tasted was really good and it was also from a korean store. 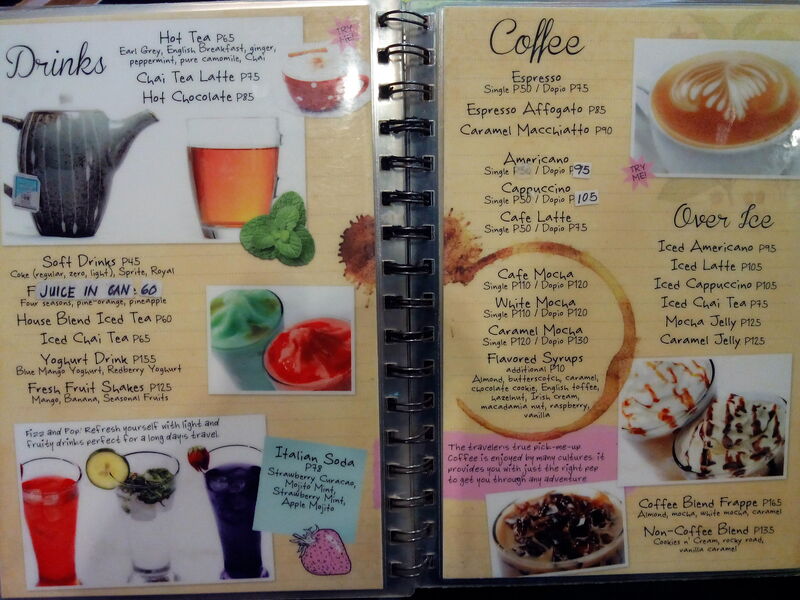 Their waffles on the menu were also enticing and the drinks were really very colorful. That’s it for my first review and I hope you check them out!